Are you a beast when it comes to outdoor grilling? Or are you more of the creative artisan in the areas of cuisine delights in the kitchen? Either way, simple cloth kitchen mats or towels are no way to treat your precious hands when dealing with high temperatures that could cause you to burn yourself and pause the food preparation, ruining everything. It’s time to throw away whatever excuse you have for kitchen mitts and potholders you currently have and invest in the last kitchen heat resistant hand protector you will ever need for life. After spending several days searching and testing.We have found the best heat resistant gloves for grilling, barbecuing, frying, and all-around cooking hand protectors available. All of them are great and all of them have fantastic designs. Now, all you have to do is decide which one is right for you. The Heat Aid Extreme is a unique, durable and protective hand protector for when you are cooking with extreme temperatures both inside and outside. They are designed with 2 layers of a unique material that has been knitted seamlessly together with the highest quality aramid fabric for the utmost protection. This synthetic material is high in performance and durability; it is capable of withstanding temperatures over 900 degrees F. These protectors also are designed with Para-aramid and meta-aramid threads the improve upon the mitts allowing you to hold those hot temperature items for an extended period of time with a comfortable dexterity. If for any reason you are unsatisfied, the company offers a full refund. This product received very high feedbacks; however, a few complained they did not work as advertised, and some were too small for hand comfort. Otherwise, as advertised by the company with thousands of sales, the majority of consumers who purchased this product were very pleased, especially when working with cast iron. This dynamo cooking aid is multifunctional. You can literally stick your hands straight into the flames of the bonfire or grill to move an item or while tending the grill or fireplace without the concern of hurting yourself. Extreme heat resistant has a new meaning when it comes to the material used within these gloves, which is the same material firefighters use, so you know you will be safe. Ironically, they are so well insulated, not only will they protect you from the heat, they can also protect your hands from the blistering wintery frostbite snow. Some said hands got hot too quickly. These high heat cooking hand protectors went all out to impress customers with an amazing product. Designed with a cuff that goes up past the forearm, you are guaranteed to be safe with this product made with materials of Kevlar, Nomex, Aramid, and Silicone. The designers wanted an unbeatable product, so they created one that you can cook with, but you can even weld with these amazing protectors of up to 932 degrees F. They also offer a firm silicon grip and a CE-Level 3 Fiber that is Cut Resistant, so your hands and forearms are safe from knives and sharp objects while you are handling those hot objects. BlueFire thought of everything. I found a few complaints about faulty equipment among the bunch of the line. However, hundreds of BlueFire fans rave about their qualifications and are surprised when it comes to their welding abilities. Another bonus from these great hand protectors that consumers love is that it works great alongside the Big Green Egg grill. 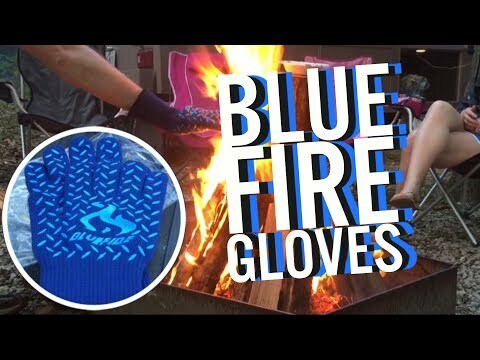 BlueFire ensures they were made with the highest and greatest heat resistant material available, and they also ensured the diversity and durability, so you can use it for multiple occasions. In addition to adding the cut resistant, the long forearm protector and the grip made from Silicone, BlueFire may have cooks and welders sold everywhere on this product. More like an extreme heat cooking and grilling kitchen mitt; the Ekogrip is the kitchen aid to end all kitchen aid. Made from 100% silicone to prevent slipping from your hand and from whatever you are holding; as well as to handle temperatures up to 424-degree F with great ease. This means you can pick up your Thanksgiving turkey with both hands and set it down on its platter or grab a hot potato straight out of the microwave. These are fun looking tools that are waterproof, insulated, and come in three different sizes with a super long cuff, so they are perfect for the wonder chef in your family. Best of all, they come with a lifetime replacement guarantee. Several compliments about the design of the product; for example, the palm of the product which has a bumpy design. For one, who makes their own rub, was able to hand rub the meats over the grill several times throughout the day. Another praise is the 5-finger design instead of closed hand design. Apparently, if you are cooking with oil and leave the product on as in stir-frying, the product gets slippery and can easily drop pans etc. The design, the ability to clean in the dishwasher, the multi-sizes and heat resistance of this pair, make this an obvious choice for purchase. The company seems to think of everything. Even the slippage issue seems odd considering the raised bumpy surface of the palm, but if you have this knowledge, it’s easy to avoid getting grease on the palm. Moreover, if for any reason a customer is dissatisfied, you can trust a company that has a lifetime warranty. These are wonderful kitchen and grilling additions. Creatively designed to look like some kind of monster hands, the beast armor is created to protect your hands during all types of cooking while engaging heats up to 662-degrees F. The Silicone and Kevlar mixed properties of the design make the product both lightweight, thermal protected, and waterproof machine washable. Additionally, this design creates a non-slip protection, so you never have to worry about dishes slipping from your hands. This product is also designed to be a one size fits all with an armor protected ribbed cuff that goes halfway up your arm offering full protection whether you are cooking, grilling, bar-b-cueing, smoking, or whatever your favorite cooking desire may be. Finally, the beast comes with a 100% money back lifetime guarantee for anyone not completely satisfied. It seems one size does not fit all as these beasts run small. Another unfortunate complaint is that when taking them off, the inner liner comes with your hands, making it difficult to put them back on. People who praise the beast argue that they do exactly what they claim, and the manufacturer even says that they stretch out to any size hand when you work with them. Different customers rave about different grills they have used this product with and how durable they have been over the years. The beast offers your hands lifetime protection for whatever type of cooking you prefer up to 625-degree temperatures. Made from Silicone and Kevlar materials up to your forearms you are guaranteed safety and protection from this heat-resistant product. Additionally, they are waterproof, so cleanup is easy by putting them in the dishwasher, and they are slip-proof too. This one size fits all product is 100% guaranteed for life, and the company also offers several delicious recipes for you to try out with your new Beast Cooking hand protectors. Some complain that one size does not fit all, except manufacture has instructions for this. This product is the most versatile product for heat resistance on the market. Not only are they great for cooking they are also ideal for many other projects like yarn dying and beer brewing; there is nothing this product can’t handle. The 13’ inch large one size fits all not only protect your hand but also most of your forearm with its FDA compliant neoprene coating designed to resist fire and melting. Inside is a liner of two layers of cotton for maximum comfort and insulation. The loose fit permits air to enter and keep your hands cool while you tend to your project. The five-finger design with its neoprene coating makes it perfect when dealing with water, oil, grease, heat, even chemicals, and cleaning is a snap. Simply wash with a little soap and let them air dry. When washing the glove, a lot of dye came out, if the dye is coming out in the wash, is it coming out in the meat that is being cooked? Others responded they didn’t have this problem so it might be a one-time thing. These are a must-have for the serious grillers. You are able to pull apart whole pigs right from the fire with no discomfort. 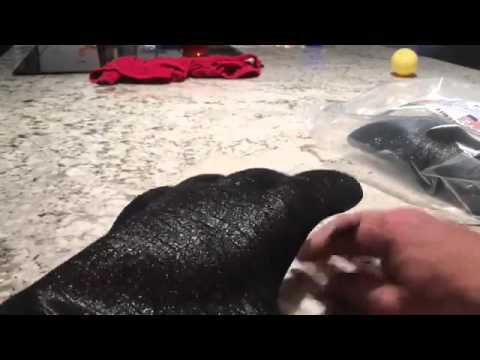 They are the best pit glove people have ever used and the clean up couldn’t be easier. This product was designed professionally to protect your hands while you work on your next meal, grill, or project. They are made from FDA-approved neoprene type rubber, which makes them waterproof and fire and stain retardant. The textured palm, the cotton liner all were designed to provide easy, comfortable grip and dexterity. You will not be disappointed with this durable product. One pair seemed to lose dye when cleaning. This product might be the grill and kitchen mate you have been waiting for to help you with all your cooking needs. Coated completely in neoprene the entire 17″ in length, your hands and forearms are completely protected from the heat and fire of the pit, grill, and oven. The neoprene also offers the highest quality in dexterity and durability. The inside liner is made from subtle jersey cotton that is soft against your skin giving added insulation to protect from the heat. They are also waterproof making them resilient against grease, water, sauces, stains and more. A three-month guarantee comes with the product to ensure complete customer satisfaction. There is only some people had problems with the product not resisting the heat to their liking. This seems like a product flaw and perhaps another pair should replace theirs. Others rave that with this product they were able to put their ribs directly into their smoker; while another raved he was able to lift hooks out of a hot barrel which hung meat. Customers can’t compliment this product enough about how great they are for grilling, their dexterity, and their easiness to clean. Having scanned most of the reviews, this product seems to deliver what is promised. The Neoprene coating of this five-fingered grilling 17″ grilling aid does indeed protect your hands and forearm from all the heat coming off your grill, smoker, stove, and campfire. Bar-B-Que never seemed so easy before. The soft inner lining protects and insulates your hands, while the outside stays waterproof and grease, stain, and sauce proof too. A three-month guarantee is offered by the manufacturer to ensure your happiness. Only 5 pairs had manufacturing flaws. This product may have been designed for the pit, but it can handle so much more. This 17” FDA approved neoprene coated five-finger designed product not only withstands the heat and melting from pits, smokers and grills, they’re also the perfect match for the beer brewer and yarn dyer in you too. Created with a textured, insulated palm to help prevent slippage and manage whatever you might be handling. Additionally, the liner is soft cotton and double layered to provide the ultimate comfort and insulation from the heat; all the while, the product stays loose on your hand providing cool and comfortable air flow. The neoprene coating also makes this perfect grill aid easy to clean and resilient to grease, water, heat, oil, chemical liquids and stains, simply wash with a little soap and water and let air dry. They also come in a 14″ size as well. For warranty information, please contact the manufacturer. There seems to be a breaking in point with this product as a few people complained of stiffness. Others offered that they become more pliable with use and working with the product especially in the heat. They are great for handling meats over a hot grill. They even work great on septic tanks! Used with great ease in a full-service restaurant. These truly are the best multi-purpose hand protector. Created for those who love to grill these textured and insulated palm, five-finger, neoprene, non-slip grill mates can handle so much more. You can handle hot and greasy Bar-B-Que, meats in your smoker, and chicken and pork butts in your Rotisserie without any heat damage to your hand and forearms. You can also handle beer brewing and yarn dying if that is your hobby. This FDA approved product is also easy to clean with simple soap and water, leaving all traces of oil, grease, even chemical liquids behind with a simple washing. Protect your hands from extremely high temperatures of 932-degrees F when you wear these Nomex, Kevlar, and Silicone on the outside and 100% Cotton on the inside BBQ, grilling, baking and cooking fireplace mitts. With this perfect product, you can touch hot coals, adjust logs on a fireplace, remove hot pans from the oven, even change a lightbulb. Even though they are not waterproof, you can easily clean them by putting them in the dishwasher. We offer a 30-day guarantee and a free gift of a Recipe eBook with healthy and delicious recipes sent to your e-mail. Additionally, if you ever need help, our customer service is available 24/7 to aid you with whatever you might need. Only one concern and that was that the heat seeped through where there wasn’t any red silicone. This is just a one-time concern and the entire mitt is practically covered so it may have been a one-time fluke. Most people herald the Elino’s as providing everything they advertise; great coverage, incredible protection, and awesome grip. They are even testing the product by placing them in a fire for a small amount of time and they didn’t melt or catch on fire but only got warm. The Elino’s heat resistant product is perfect for every type of cooking. They can resist temperatures gauging upwards of 932 degrees F with their Silicone, Kevlar, and Nomex exterior design, and their 100% cotton double layer interior, making them the ideal grilling, barbecuing, and campfire all-purpose hand protector. While they aren’t 100% waterproof they are dishwasher safe, so cleaning them is a breeze. They also include a side hook to hang them up with once you are finished with your cooking and cleaning. The 30-day money back guarantee ensures customer satisfaction along with a 24/7 customer service line to help with any questions or problems that may arise. Finally, the manufacturer also offers a free recipe eBook with nutritional and delicious recipes delivered directly to your e-mail. Evridwear went out of their way to get all the certifications to back up and support their supreme heat and cut resistant cooking hand protectors. They are EN407 and CE certified grill and oven heat defiant, able to handle 932-degree F temperatures. They are EN388 certified, having them made from materials that are impervious to cuts so working with sharp knives and metals will not be a deterrent. They are also made from a superior class Aramid 1313, one of the Kevlar fibers, coating the outside which protects an insulates from extreme heat and a lining of 100% cotton for soft comfort which also prevents sweating. These materials are easy to clean by simply placing them in the dishwasher. Moreover, Evridwear offers a unique design that is a silicone grip that is anti-slip; this includes a two-sided grip, Silicone fingers that are anti-slip, a palm that is slip-resilient and has the dexterity to easily grasp items. Finally, if you are not satisfied, they offer a 100% money back guarantee, and they offer a 300 Recipe eBook that they will send to your email. More than a few complaints about heat penetrating the material and the length of the gloves not matching the pictures. In these cases, I would either exchange or get my money back considering the positive review refute these claims albeit there were several. For ones who complain about the heat getting through, you have 10 who brag about picking up charcoal right out of the fire and holding it for seconds before they even began to feel the first signs of heat. They protected others from the intense heat from their new smokers, grills, and kitchen ovens, and they were grateful for the extended length protection. All the certificates in the world don’t matter if more than a couple of customers are dissatisfied. Evidwear has a good product, but it seems they are letting too many faulty products off the production line. They have put so much into creating and designing a product with Aramid coating, the best there is, and getting cut resistant certified that they shouldn’t let those few faulty ones ruin their excellent reputation. Another concern is that they are not waterproof and when water is around the cooking, steam off the mitt can cause them to lose their functionality completely. Stemaj offers protection like none other. They use a military grade 3-layer Synthetic Para-Aramid Kevlar design, that is found in firefighter suits, as the exterior heat retardant material to protect your hands against temperatures up to 932 degrees F. They also have an extended sleeve with a cut resistance of a level 3 to allow you to use knives while cooking without fear of cuts or scrapes. They are extremely versatile and can be used from the fireplace, smoker, grill, and straight to the inside broiler. Their one size fits all makes them tremendously flexible, and the woven in loops are there for you to hang them right off the grill. Super easy to clean, the Stemaj are machine or hand washable; however, the warning from the company is as follows: apply regular gentle detergent and let air dry. Don’t utilize bleach, bleach will damage the functioning of our aramid threads. When you have the open honesty and true care and craftsmanship of a company like STEMAJ, you do not get any serious complaints. The quality of this product is almost beyond compare. The company delivers exactly what they advertise, a durable, high quality, heat defying product that truly protects your hands and forearms and has the coolest look to them that your neighbors will comment about them. Stemaj has proven themselves to be a company of honor and trust. One knows they are going to receive what is advertised. In ordering Stemaj you will receive a military grade, firefighter tested 3-layer Aramid Kevlar on the exterior providing you with the maximum protection available and withstanding heats up to 932 degrees F.They have also thought of adding a level 3 cut resistance to the outer surface to prevent accidents while handling sharp instruments while you are cooking. With the changing of the leaves, the brisk fall air is right around the corner, and that means its time to break out those gills, smokers, or head out camping and cook out over an open fire. It also means that Thanksgiving is right around the corner, and if you’re anything like my family, you want that turkey to be handled with the utmost of care, all of its moist juices trapped inside creating a culinary perfection; plus, you will have all the additional casseroles cooking in that on-going hot oven, warming up the entire home. With all those delightful ways of high-temperature food preparation, you need to think about your safety and if you are ready for fall and the holiday season. Primarily, you should inspect your oven mitts. If they are the all-cloth patted ones like your grandmother used to use, no offense to nanna, but throw those mitts away and invest in one of the numerous Heat Resistant, BBQ, Gilling and Cooking Gloves. The majority have some outrageous visual design to make them stand out from the rest. When you are ready to protect your hands and purchase their life-time protectors, these are the qualities you should look for in them. What are they made from? All of the ones we reviewed were either Silicone or some variety of Kevlar, mostly Aramid. Both materials have their pros and cons and it is up to the individual cooker to decide which elements are more important to him or her. Easily takes a baked potato out of the oven. The entire purpose of purchasing this product is to withstand high temperatures, if they aren’t rated to do so, then they aren’t serving much of their purpose. When grills and smokers let alone open fires can easily hit temperatures of 500 degrees, you need hand protectors that aren’t going to wimp out on you. You do not want a product that has the possibility of melting, allowing for such heat to enter your hand burn and blister, or so much worse. This is one area you do not want to withhold on. These products come in different cuff lengths, from gauntlet size to a simple wrist length. The lengthier the cuff, the additional protection it provides for your arm overheated, blazing coals, when stretching across a big grill, especially when grease begins to splatter around. Cuff length can be a decision of individual choice, but if you own a larger-sized smoker or grill or prefer cooking over open flames, the longer the sleeves the safer you will be. When choosing a set of hand protectors, you should think about how frequently you will be utilizing them for transferring intentions; some products are overly thick and do not allow you much feeling on the item you are handling. When carrying grill platters and other items of extreme temperatures, you want the knowledge that you have a stable grip upon them. Not only is this for your protection, but for the protection of those closest to you. 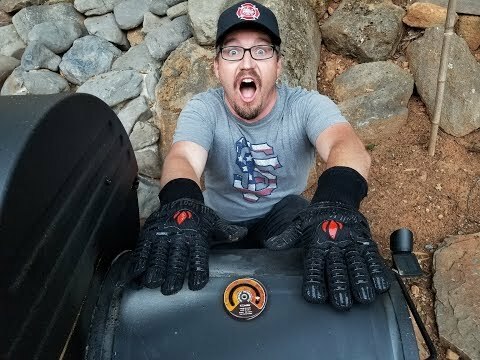 With literally hundreds of grilling and cooking hand protection products from which to choose, each with their own unique design, some which are genuinely crazy from a marketing perspective, and each using elaborate terminology to grab the attention of the perspective target audience, the choice can be an overwhelming one. Prices also vary and range attempting to draw the attention of the more frugal shopper and earn their hard-earned money; however, where safety and dealing with extreme heat and high temperatures are concerned, this is one time where loosening the purse strings needs to be considered, especially when you are looking at a matter of low expensive is most scenarios. Always remember that the best option always cost more budget. The definitive decision lays in the purpose for which you will be using the product. You ultimately have two choices. Ones that are ideal for temperatures up to 900° F but are not water resistant and are likely to cause burns, or ones that are waterproof but only truly safe for temperatures around 500-600° F and can get slippery if too much oil gets on them. We hope that our Fall’s edition for 2018 for Best Buys and Buyers Guide for the best extreme heat resistant grill mates-hand protectors helps you with the decision you have ahead of you. Happy Grilling! Safety Gloves: Why Workers Must Wear Them!